Our second annual competition was a success! In this edition of the Florida Mine Safety Program e-newsletter, you'll find information recapping the Second Annual Surface Mining Emergency Response Training and Competition. We had an amazing time at our Second Annual Surface Mining Emergency Response Training and Competition in Havana, Fla on Feb. 25-28! The competition included an array of amazing teams, vendors, sponsors and non-competitors. To view photos from the competition, click here. The second and third place trophies for the knot tying competition will be sent out to all winners shortly. Stay tuned for more photos from the event, which will be posted on our Facebook page soon. Be sure to "like" our Facebook page here for updates! 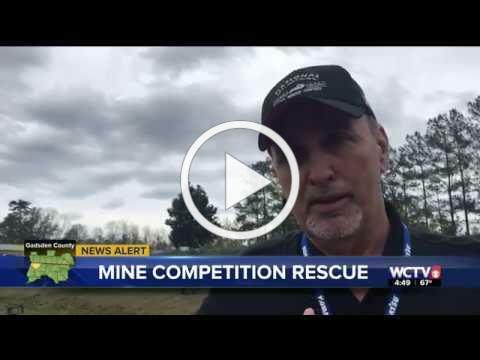 WCTV, Tallahassee's CBS-affiliated TV news station, produced a story on our Second Annual Surface Mining Emergency Response Training and Competition. Click the image below for a look at some of the competing emergency response teams and an interview with Sam Pierce, MSHA's Southeastern District Manager. WTXL, Tallahassee's ABC-affiliated TV news station, also made an appearance at our Second Annual Surface Mining Emergency Response Training and Competition. They spoke with some of the emergency response team members and mining professionals at the competition, who shared why this event is so important. Click here to take a look at the full article on their website! Registration is now open for the 2019 Joint National Meeting and Training Seminar of the Joseph A. Holmes Safety Association and the Holmes Mine Rescue Association. The conference will be held on June 18-20 at the Wyndham Virginia Beach Oceanfront in Virginia Beach, VA. This meeting will provide a variety of safety and health and mine rescue workshops presented by national and international experts representing all sectors of mining.